Learn how to make this classic dish in one of our Spring Cooking Classes. 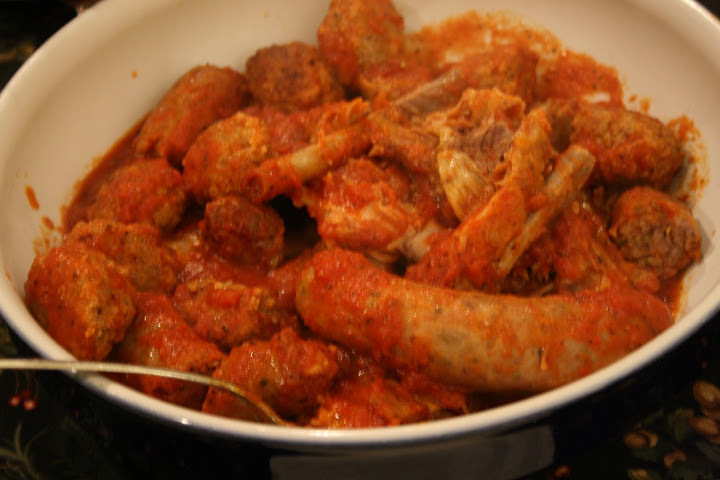 If you are an Italian-American, Sunday Gravy was probably a ritual in your family as it was in mine. 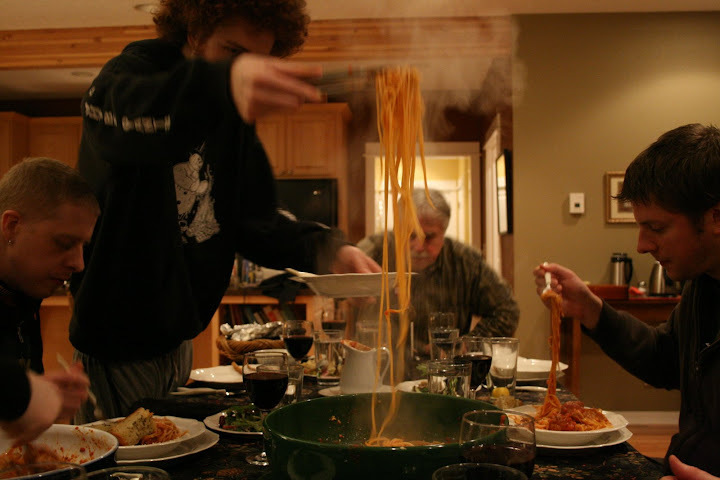 You might know the term gravy as it gained notoriety in the HBO hit, The Sopranos, but certainly it is not universal to all Italian-American families. 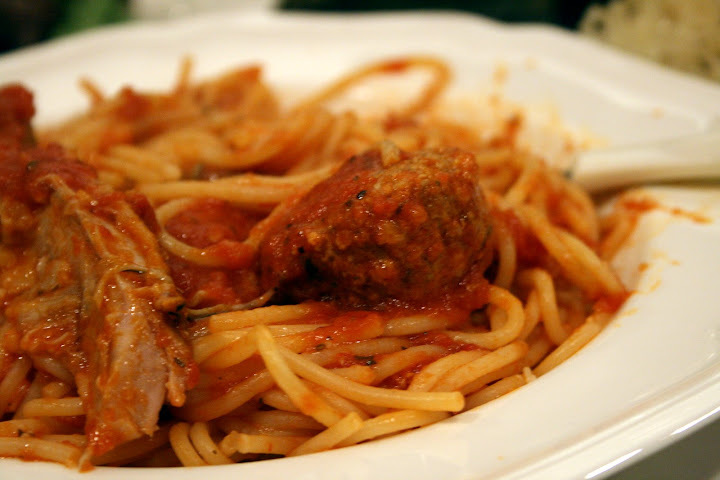 Many of you know this classic dish in its simplest form as spaghetti and meatballs. But it is really so much more than that. Our family did not call it "gravy." We simply called it "sauce." My father tells me that growing up they called it "Il Sugo", meaning "the sauce," as opposed to "un sugo" meaning one of many sauces. 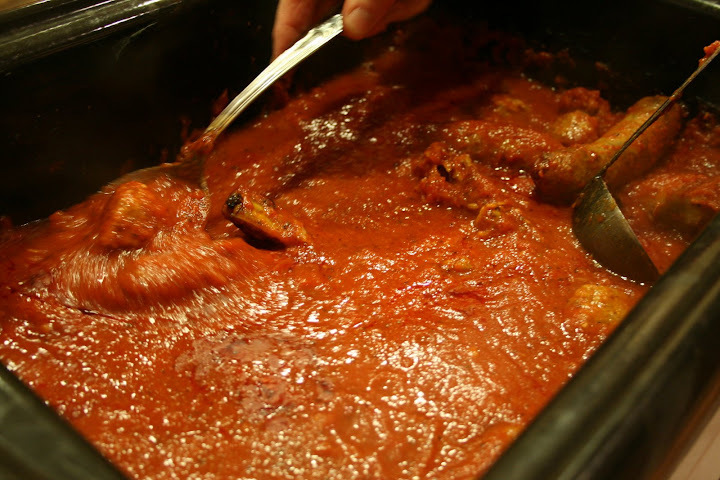 This is the sauce that mama prepared, that simmered on the stove all day with meatballs, Italian sausage, possibly some pork ribs or braciole. For me, this is the ultimate comfort food, my proverbial 'last meal' request. This is the dish that is synonymous with family and tradition. This is the most often requested meal by our children for special occasions. Our own family ritual went something like this. After nine o'clock Mass at Our Lady of Mt. Carmel, we stopped at DiVincenzo's Bakery, and stood in a long line to get two really fresh just-out-of-the-oven baguettes to take home. You had to get two because one would be half eaten by the time you got home. Mom would get the sauce started, while Dad turned the radio on to the Italian Hour. When that was over, then it was a mix of Sinatra, Dino and Jerry Vale from Dad's record collection. Meanwhile, we lingered over the Sunday paper while the meats simmered in the sauce or "gravy". As the sauce cooked down, the aroma filled the house stimulating your appetite to a seemingly insatiable level. Every now and then you had to go in the kitchen to give the sauce a stir so that it didn't burn,and of course snitch a meatball in the process. It's important to make more meatballs than you think you will need. Mixing and rolling those meatballs on Saturday night was my job and little did I realize then, the beginning of my love for cooking. By one o'clock the windows were pretty well steamed up and the smell of tomato sauce permeated all of your senses. Finally we got to sit down to a repast that could have fed an army. If unexpected guests arrived---no problem. There was always enough. We always served the pasta first (except we didn't call it pasta then---we called it macaroni). Then came the meat followed by the salad. And dessert? Fuggeddaboudit-who had room for it? Well perhaps we had room later that evening while we were sitting around watching Ed Sullivan. Most Italian-American men are fiercely loyal to their mother's 'il sugo' and I am no different. I will be so bold as to say that I think I have improved on Mom's sauce by virtue of now using locally raised grass-fed beef and by making our own sausage from pigs that we have raised ourselves. We know what they have eaten and not eaten. An interesting side note is that my mother who is not Italian, certainly learned to cook like one. And you can too. Sunday Gravy, The Big Ragu is one of the many offerings in our Spring Cooking Classes at Crippen Creek. Our most popular class, Artisan Bread Baking is on the schedule several times. We have also scheduled a class on Italian Country Cooking,(how to eat and entertain, Italian style), Pizza and Calzone and Just Desserts (in which you can learn how to make a Perfect Tiramisu). We keep our class size small so that you get lots of personal attention, accommodating the aspiring novice as well as the seasoned veteran. It's a great way to spend an afternoon or evening, or better yet come out for a Culinary Getaway Weekend. Consider a gift certificate for a cooking class as a great alternative to buying more stuff. A complete listing of our classes is now listed on our website. We hope to see you at one of our classes. OK, you are probably ready for some pictures by now. Here are a few shots from our cooking classes. Now what about you? Do you have a version of this classic dish in your family? Or were you lucky enough to have an Italian friend that invited you to Sunday dinner? How about sharing your own ethnic family traditions with our readers? Are there some cooking class themes you would like for us to offer? Italyville and Proud Italian Cook. I love these blogs.